Joseph Mary Plunkett (Irish: Seosamh Máire Pluincéid, 21 November 1887 – 4 May 1916) was an Irish nationalist, poet, journalist, and a leader of the 1916 Easter Rising. Plunkett was born at 26 Upper Fitzwilliam Street in one of Dublin’s most affluent neighborhoods. Both his parents came from wealthy backgrounds,and his father, George Noble Plunkett, had been made a papal count. Despite being born into a life of privilege, young Joe Plunkett did not have an easy childhood. Plunkett contracted tuberculosis at a young age. This was to be a lifelong burden. His mother was unwilling to believe his health was as bad as it was. He spent part of his youth in the warmer climates of the Mediterranean and north Africa. He was educated at the Catholic University School (CUS) and by the Jesuits at Belvedere College in Dublin and later at Stonyhurst College, in Lancashire, where he acquired some military knowledge from the Officers’ Training Corps. Throughout his life, Joseph Plunkett took an active interest in Irish heritage and the Irish language, and also studied Esperanto. 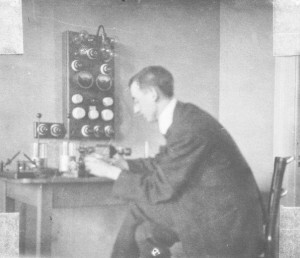 Plunkett was one of the founders of the Irish Esperanto League. 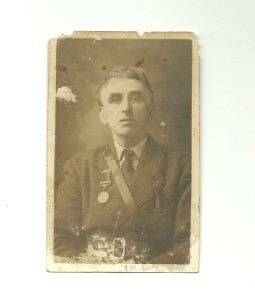 He joined the Gaelic League and began studying with Thomas MacDonagh, with whom he formed a lifelong friendship. The two were both poets with an interest in theater, and both were early members of the Irish Volunteers, joining their provisional committee. 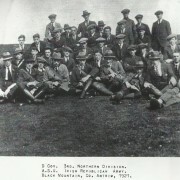 Plunkett’s interest in Irish nationalism spread throughout his family, notably to his younger brothers George and John, as well as his father, who allowed his property in Kimmage, south Dublin, to be used as a training camp for young men who wished to escape conscription in England during World War I. 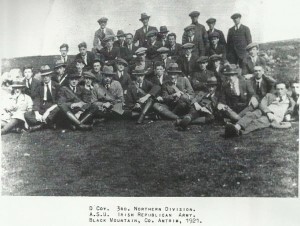 Men there were instead trained to fight for Ireland. Sometime in 1915 Joseph Plunkett joined the Irish Republican Brotherhood and soon after was sent to Germany to meet with Roger Casement, who was negotiating with the German government on behalf of Ireland. Casement’s role as emissary was self-appointed, and, as he was not a member of the IRB, that organisation’s leadership wished to have one of their own contact Germany to negotiate German aid for an uprising the following year. He was seeking (but not limiting himself to) a shipment of arms. Casement, on the other hand, spent most of his energies recruiting Irish prisoners of war in Germany to form a brigade to fight instead for Ireland. Some nationalists in Ireland saw this as a fruitless endeavor, and preferred to seek weapons. Plunkett successfully got a promise of a German arms shipment to coincide with the rising. 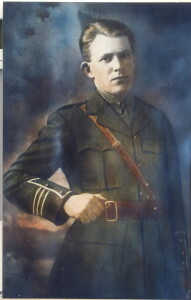 Plunkett was one of the original members of the IRB Military Committee that was responsible for planning the Easter Rising,, and it was largely his plan that was followed. Shortly before the rising was to begin, Plunkett was hospitalized following a turn for the worse in his health. He had an operation on his neck glands days before Easter and had to struggle out of bed to take part in what was to follow. Still bandaged, he took his place in the General Post Office with several other of the rising’s leaders such as Patrick Pearse and Tom Clarke, though his health prevented him from being terribly active. 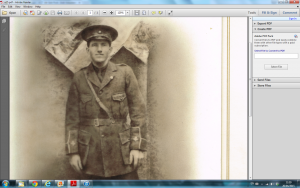 His energetic aide de camp was Michael Collins. Following the surrender Plunkett was held in Kilmainham jail, and faced a court martial. 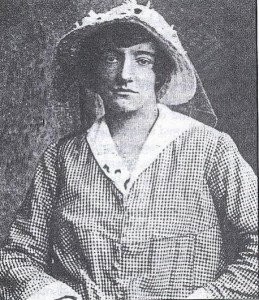 Seven hours before his execution by firing squad at the age of 28, he was married in the prison chapel to his sweetheart Grace Gifford, a Protestant convert to Catholicism, whose sister, Muriel, had years before also converted and married his best friend Thomas MacDonagh, who was also executed for his role in the Easter Rising. His brothers George Oliver Plunkett and Jack Plunkett joined him in the Easter Rising and later became important IRA men. His father’s cousin, Horace Plunkett, was a Protestant and unionist who sought to reconcile unionists and nationalists. His home was burned down by the Anti-Treaty IRA during the Civil War. The main railway station in Waterford City is named after him as is Joseph Plunkett tower in Ballymun. Plunkett barracks in the Curragh Camp, County Kildare is also named after him. ^ O’Neill, Marie (2000). Grace Gifford Plunkett and Irish freedom: tragic bride of 1916. Dublin: Irish Academic Press. p. 18. ISBN 978-0-7165-2666-7. ^ “Review Of ‘All in the Blood’”. A&A Farmar Book Publishers. Retrieved 4 Nov 2010. ^ “[Count Plunkett] George Noble Plunkett”. Princess Grace Irish Library (Monaco). Retrieved 5 Nov 2010. 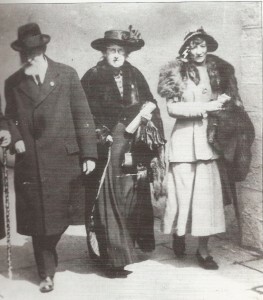 Count Plunkett and his wife with Grace Gifford. She married Joseph Mary Plunkett in Kilmainham Jail Chapel hours before his execution. The song “Grace” by Jim McCann is a very moving tribute to this historical couple. Grace Gifford This is the actual dress she wore at her marriage to Joe Plunkett in Kilmainham Jail just before his execution. 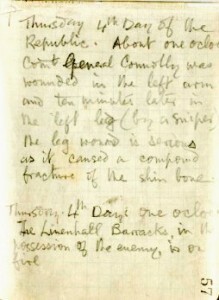 A page from Joe Plunketts note book 1916, written at the height of battle. In it he explains how connolly was shot and how bad his wounds were.